Tibetan Monks at Silver Hill Hospital performing a dance in 2016. NEW CANAAN — Silver Hill Hospital will once again host the Labrang Tashi Kyil Monks for a visual and experiential cultural event. The four-day event will take place at Silver Hill from Jan. 25 to 28. The cultural event looks to educate the public about the culture and religion of Tibet, the teachings of the Dharma and raise funds for the monks’ monastery. A special presentation for the public is scheduled for Jan. 26 at 1 p.m. at Silver Hill’s Martin Center. The community event is free to the public. President and Medical Director of Silver Hill Hospital Andrew Gerber said the staff is thrilled and privileged to host the Tashi Kyil Monks again. The monks previously visited in 2013 and 2016. “This is another opportunity for us to learn from them, from them to learn from us, and for all of that learning to ultimately come out in the service of our patients,” he said. 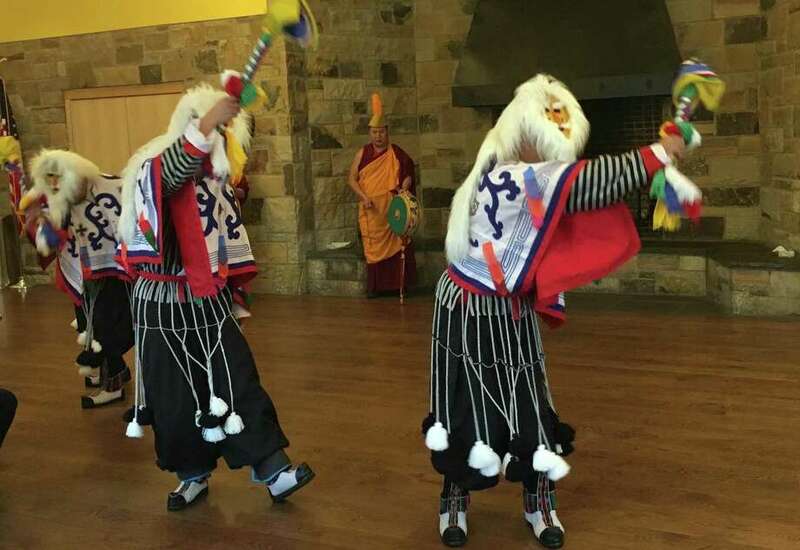 The Jan. 26 event will feature six Tashi Kyil monks who will perform a Tashi Sholpa dance, which was created to welcome the Dalai Lama during visits to Tibetan monasteries. The monks will also lead a Chod meditation, which is a cermony to cut off attachments, accompanied by a sacred Buddhist dance called Cham. Gerber said the event is an important way to breakdown any preconceptions about a western versus eastern approach to mental health. Community members will have the opportunity to observe the monks work on a sacred sand Mandala on world peace, he said. This initiative will take four days to complete and involves millions of grains of sand resulting in a multi-colored design symbolizing healing. “I hope and I believe an event like this one speaks to breaking down barriers and talking across differences in a way that’s not just good for our patients or staff, but our society as a whole,” Gerber said. Isdaner said with the monks’ lessons on meditation and mindfulness, and the hands-on activities they lead — which involve focus and patience — Silver Hill regards the monks’ time with the patients as a unique, informal type of therapy.